This inscription can still be found on a little gray headstone at the McCune Cemetery near Harmony, Pennsylvania, the town where Emma and Joseph Smith resided during the early stages of the translation of the Book of Mormon. 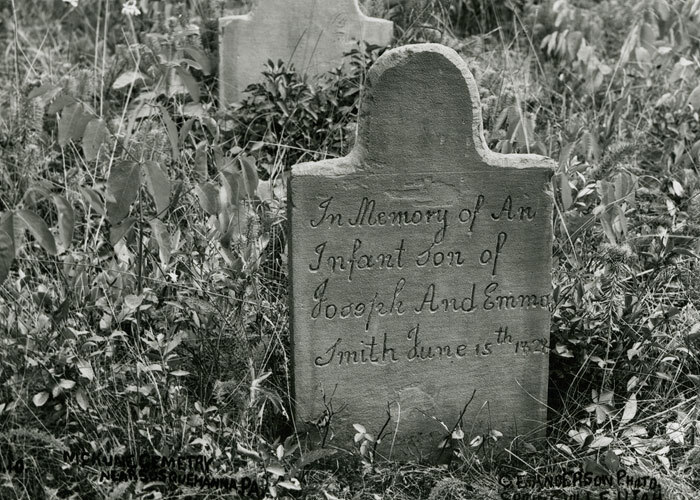 The baby, whom they might have named Alvin after the prophet’s deceased older brother, died hours after it was born.2 But this wasn’t the only tragic loss the Smith’s sustained during that dark month in 1828. It happened just as Martin Harris was busy losing the first 116 pages of the Book of Mormon manuscript. Joseph spent two weeks nursing Emma back to health following the death of the baby then made the 150 mile journey to Palmyra where he learned about this other loss. He feared telling Emma “lest I should kill her at once,” and he feared he’d lost his prophetic commission through his impertinence.3 Soon he dictated a revelation which sternly called him to repentance, but which also extended mercy: “[T]hou art still chosen,” the revelation asserted, “and [the Lord] will only cause thee to be afflicted for a season” (D&C 3:10).4 The revelation makes no direct reference to the devastating loss of Smith’s child the previous month. In fact, the loss of the manuscript has overshadowed the loss of the Emma and Joseph’s child in most subsequent accounts of Joseph’s life. This is perhaps due in part to the limitations of the historical record—no specific description of the child appears in the revelations, journal entries or other voluminous records Joseph himself oversaw after 1828. A few troubling descriptions of the child do appear in critical affidavits collected in the 1830s and thereafter. These descriptions provide a detail that serves as one possible explanation for the Mormons’ lack of attention to the baby: it evidently bore the marks of disability. Tracing the invocation of Joseph’s disabled, deceased child sheds light on changing attitudes toward disability in the 19th and 20th centuries. Initially, mention of the deformed corpse didn’t appear in sources friendly to Joseph, but in affidavits collected to discredit him. In 1834 Sophia Lewis reported that she “was present at the birth of this child, and that it was still-born and very much deformed.” The description was not intended to evoke sympathy for the bereaved. Rather, it was included in an affidavit attacking Joseph’s character, and it appeared in multiple newspapers and the first full-length anti-Mormon book.5 Decades later, another woman claimed Emma “had a child which was still-born and much deformed” and a Yale graduate would invoke the rumor as further justification for his medical diagnosis of Joseph as a epileptic.6 Up to 1903, such descriptions appear only in critical sources. As described in my thesis, a deformed baby could be interpreted by Joseph’s contemporaries as being a divine curse, as was the case for Anne Hutchison and Mary Dyer in earlier American history. Perhaps this is why Lucy Mack Smith avoids that point in what I believe is the only direct reference to the child in Mormon publications of the period. She described him as a “dear little stranger” who was “very soon snatched from [Emma’s] arms and borne aloft to that world of spirits before it had time [to] learn good or evil….”7 Over time, ascribing disability and death to God’s direct providence largely fell out of favor. By the time Riley wrote his book in 1903, disability was invoked in a secular fashion to underscore hereditary inferiority, which is precisely how Riley used it. Such concepts would inform the eugenics movement and subsequently even Nazism. Fawn Brodie would rely on Riley for several observations in her biography of Joseph Smith, but she does not use baby Alvin as he did. She peripherally mentions the death but not the deformity while recounting the loss of the BoM manuscript pages.8 Richard Bushman also briefly mentions the death but no deformity during his account of the lost manuscript pages.9 Linda King Newell and Valeen Tippetts Avery pay more attention to the loss in their biography of Emma Smith. They related the incident–including the “deformity”–in a way that is likely to evoke sympathy in modern readers.10 Sam Brown suggests Smith blamed himself for the death of the child and focuses on the child’s name (Alvin) as an example of a waning Protestant necronym tradition.11 A recent Ensign photographic essay notes that the Smith’s first baby, “born with un-described birth defects, survived only a short time.” Authors no longer point to the child as evidence of Smith’s sin or genetic inferiority, but as a way for modern readers to sympathize with the parents. Disability in this case has moved from a curse to a tragedy. Joseph’s teachings on child resurrection, infant baptism, and the suffering of the innocent must have been deeply informed by his real-life experiences. In other words, Joseph’s experiences and those of his fellow Mormons influenced the questions he asked and thus the revelations they received. I believe this mode of participatory revelation explains, in part, the lack of specific revelations in our formative canon in regards to intellectual disability. There is no question that historians have to do the best they can with a severely fragmented historical record. This is yet another reminder about how one event that goes somewhat unrecorded or for whatever reason gets obscured in the historical record can be lost in later interpretive history. The potentially formative experience of Alvin’s death for Joseph receives only a word or two in book-length treatments of the prophet’s life. How did the loss really affect his later teachings? I can only speculate about such things while a deformed, dead child becomes a mere footnote in a story about a lost manuscript. In memory of an infant son. 1. Dan Vogel, ed., Early Mormon Documents Vol. 4 (Salt Lake City: Signature Books, 1996), 418–419. The photograph is from “Joseph and Emma: Moments in Their Lives,” Ensign (July 2012), online here. 2. The name was recorded in a family Bible by an unknown hand. See Vogel, ed., Early Mormon Documents 1:584. The Joseph Smith Papers Project researchers have questioned the name, see comment 7 below. 3. Lucy Mack Smith described these circumstances in her family memoir. See Lavina Fielding Anderson, ed., Lucy’s Book: A Critical Edition of Lucy Mack Smith’s Family Memoir (Salt Lake City: Signature Books, 2001), 419. 4. The remark that Joseph was “afflicted for a season” is found in the manuscript of the revelation, and it was present when the revelation was first published in the 1833 Book of Commandments. It no longer appears in the version found in today’s Doctrine and Covenants, though. The revelation’s tense has also been changed from telling Smith he would eventually be given his ability to translate back to telling him it has been given back. Thus this experience in Joseph’s life provides another moment to reflect on the ways our canonized revelations have changed over time. The recent Ensign discusses revelation revision. See Robin Scott Jensen, Robert J. Woodford, and Steven C. Harper, eds. Manuscript Revelation Books. Facsimile edition. Vol. 1 of the Revelations and Translations series of The Joseph Smith Papers, edited by Dean C. Jessee, Ronald K. Esplin, and Richard Lyman Bushman (Salt Lake City: Church Historian’s Press, 2009), 9; Robin Scott Jensen, Richard E. Turley, Riley M. Lorimer, eds. Published Revelations. Vol. 2 of the Revelations and Translations series of The Joseph Smith Papers (Salt Lake City: Church Historian’s Press, 2011), 19-20. 5. See n.a., “Mormonism,” Susquehanna Register, and Northern Pennsylvanian 9 (May 1, 1834): 1; E. D. Howe, Mormonism Unvailed: or, A Faithful Account of That Singular Imposition and Delusion, from Its Rise to the Present Time (Painesville, Ohio: E. D. Howe, 1834), 269. See also Vogel, Early Mormon Documents, 4:298. 6. n.a., “Prophet Smith’s Family Relations,” Salt Lake City Daily Tribune 18 (17 October 1879): 2; Vogel, Early Mormon Documents, 4:320; I. Woodbridge Riley, The Founder of Mormonism: A Psychological Study of Joseph Smith, Jr. (New York: Dodd, Mead & Company, 1903), 347. Recall that Lucy Mack Smith said the child apparently lived a few hours, rather than being stillborn. 7. See Anderson, Lucy’s Book, 412. Childhood innocence, not disability, was the way Lucy situated the baby in regards to salvation. 8. Brodie, No Man Knows My History: The Life of Joseph Smith, the Mormon Prophet, 2nd ed., rev. and enl., 1st Vintage Books ed. (New York: Vintage Books, 1995), 54. 9. Bushman, Joseph Smith: Rough Stone Rolling (New York: Vintage Books, 2007), 67. 10. Avery and Tippetts, Mormon Enigma: Emma Hale Smith, Prophet’s Wife, “Elect Lady,” Polygamy’s Foe, 1804-1879 (Garden City: Doubleday, 1984), 27, 314 fn13. 11. Brown, In Heaven as it is on Earth: Joseph Smith and the Early Mormon Conquest of Death (New York: Oxford University Press, 2012), 56. 12.See Dan Vogel, Joseph Smith: The Making of a Prophet (Salt Lake City: Signature Books, 2004), 125; Robert D. Anderson, Inside the Mind of Joseph Smith: Psychobiography and the Book of Mormon (Salt Lake City: Signature Books, 1999), 90. Of course, the BoM said nothing on the subject of deformity and divine curses. Vogel claims that Isaac Hale and other Methodists may have given Joseph grief over the baby’s death which led him to get back at them through his Book of Mormon translation, but infant baptism wasn’t so salient a point for most Methodists to lead to the explicit condemnation in Moroni 8. Methodists generally believed infant baptism was a good thing, but not necessarily that those who did not receive it would certainly be damned. I hope to flesh this out later. 13. Dean C. Jessee, Mark Ashurst-McGee, Richard L. Jensen, eds. Journals, Volume 1: 1832–1839. Vol. 1 of the Journals series of The Joseph Smith Papers (Salt Lake City: Church Historian’s Press, 2008), 352-353. I hope it doesn’t sound over the top to say that this is beautiful and amazing, Blair, but it really is, especially in light of a similar event happening recently in my extended family and the sentiments that the parents shared at the time. I haven’t read Brown’s book on death yet, but I think it would be hard to overestimate the effect that grief and mourning had on early Mormon culture and the development of doctrine. And, as a side-note, my family and I recently visited the priesthood restoration site in Harmony, and we walked through the graveyard and saw the stones for Alvin Smith and for Emma’s parents. (They’re at the far end of the cemetery by the road.) They have all been set into granite markers. I’ve never seen anything quite like it before, but it looks like it was carefully thought out and well-done. Absolutely brilliant and fascinating. I admit that I had never even heard of this child in all the accounts of the lives of Joseph and Emma that I have undertaken. Joseph was very human (a fact that makes me respect his prophetic role that much more) and so I agree that this event (especially being the first-born) would have impacted him greatly throughout his entire life even though it was fairly common to lose a child at the time. I wonder if we will ever find out what the “deformity” was. Solid work, BHodges. I like Sam’s treatment. Though I think it is also interesting that the JSPP have argued against Alvin as the name of the child. I remember Umberto Eco’s Baudolino, in which the main character is the father of a child that is still born with physical deformity. I thought Eco captured well the psychological crisis such an event might elicit during the period of the book. J. Stap, can you give me a ref. from JSPP which discusses the name? I need to check it and incorporate it in my work. Thanks, EOR and Amy T.
An interesting thing I forgot to add in the footnotes is that Lucy’s account adheres closely to some of the gender norms of the day, as she mostly discusses Emma’s relation to the baby and its death (without directly blaming her, but still placing it within Emma’s province more than Joseph’s) whereas Joseph is much more affected by the loss of the manuscript in her account. Fascinating. Thanks to Richard Bushman I knew about the unfortunate timing of Joseph & Emma losing their first child and Martin Harris losing the plates at the same time. In fact, if I remember correctly Bushman suggests that preoccupation with the tragedy at home including Emma’s poor health as the reason that Joseph didn’t follow up sooner on the pages that Harris had in his possession. I would love one point of clarification: The people who write or spoke about the deformed child (Sophia Lewis, “another woman”, etc. ); were they all anti-Mormon? Do we have no information from Mormons of the time? Either way, would it be fair to assume that Mormons reflected the beliefs of the general population on disability? I’m struck by what a contrast there is between this historical set of beliefs and two articles in the Ensign this month–one about a deacon with autism and one about a man with HIV/AIDS who was undergoing surgery. Both subjects were treated with remarkable sensitivity. “Promising that he would show it to none but those Joseph had sanctioned, Harris set off for Palmyra with the precious manuscript. For two weeks, Joseph hardly had a moment’s peace. Emma’s child was born June 15, a son as Joseph had foretold, but still-born, and the mother herself for days hovered between life and death.2 It was not until she began to mend that her distracted husband could begin to think again about his book. achilton: notice the “still born” claim, too, which differs in the accounts. Thanks for that reference. Another example of the death shelved into the manuscript story. The other woman is Elizabeth McKune. Both women lived near the Hale’s place where the translation was going on. The Hale family had cousins by the name of Lewis, and I’m only presuming as other researchers have that Sophia was a cousin. Either way, she definitely lived there as per the census, etc. described in Vogel. She swore her affidavit against JS as part of the Hurlbut efforts which eventually became Howe’s Mormonism Unvailed. McKune was a sister of Hiel Lewis, one of the aforementioned Lewis’s. There is some confusion here. Tippetts and Avery claim that a Rhoda Skinner, wife of Emma’s brother David, testified about the deformity, but they refer to Howe’s book as the source. Howe’s book only contains Sophia Lewis’s statement on that point. Another interesting point is that only women testify as to the deformity, even though they share other claims (that JS said he was better than Jesus, etc.) with the men. I couldn’t find any mention of the deformity by friendly sources. Lucy’s account is the closest and it only mentions the death. That’s one of the core problems I tried to articulate. Historians can only guess at this question since no Mormons apparently left a record describing their feelings about it, or noting that it even happened. I think the negative stigma attached to such a birth (which could have been religiously-informed or more medically-informed), combined with a sense of propriety by loved ones disinclined to discuss such a delicate matter, were the likely reasons Mormons themselves didn’t discuss it, to the extent that they were even aware of it. Keep in mind that the Smith family had been accused of weird things involving dead bodies in the past. They publicly answered accusations about the death of Alvin Smith, for instance, but were evidently silent on the loss of JS and Emma’s baby. There were, at this point, still multiple ways of understanding a deformed child, as there are today, so it’s pretty much impossible to be sure how exactly Mormon views were aligned with wider societal views. All I can do is point to the various strains of attitude, provide some examples, and speculate as to what JS and others might have thought about it. The limits of the historical record constrain. Some are more willing than others to speculate, as we see how Vogel and Anderson using the event in their work. Thanks, BHodges, for the response. Fascinating stuff. Since that conversation I’ve wondered how Latter-day Saints in West Africa understand and cope with intellectual disability. Taking off the anthropologist’s cap and putting on the Mormon cap, clearly such a practice is at odds with our understanding of the Plan of Salvation, the worth of souls, and the sanctity of life, etc. Moreover, the Church supports humanitarian projects in Ghana around wheelchair distribution and other efforts that would indicate that the lives of individuals with disabilities have great worth, even economic value and potential. (Giving someone a wheelchair is not cheap and yet enables self-reliance in some cases.) I’m curious if the Saints there have picked up on these messages, and if these messages have influenced their views and actions towards children and adults with disabilities. My interest is not limited to West Africa, by the way; that’s just where I have had the most exposure to the topic. Anna K. (not Amanda! ): The abandonment for death of babies for with disabilities has a long and painful history. Some people have even advocated for it as an enlightened response to the “problem” of disability. More recently abortion has become a common remedy, as genetic counseling becomes more established. The rate of abortions performed when a fetus is discovered to likely have Down Syndrome is alarming. Often times this is justified on multiple grounds, including our assumptions about the quality of life for a person with a disability, economic considerations in regards to expenditure of resources in the face of poverty, etc. and on the grounds that saving such people constitutes “speciesism” (Peter Singer). As you note, various religious orders have taken the lead over time of trying to prevent these acts. The L’Arche communities are a good example of this, although I need to become more familiar with their work. And you point to an international scope, places which don’t benefit from years of civil rights activism undertaken to support people with disabilities and include them in our society. At the risk of becoming too political, there are strains of libertarianism which help facilitate such ongoing discrimination, and who oppose international measures to improve such lives for what I believe are specious reasons. But the Church itself has taken a few measures to help alleviate some problems. (I wish they didn’t put giant patches with the Church’s logo on the backs of wheelchairs, though. It’s tacky and seems like too much of an advertisement. I think a more subtle logo would be fine, but the way they have it now is gaudy. My MIL uses such a wheelchair and more than once people have approached us in public to make a remark about us being Mormons. But there are people who use these chairs who aren’t Mormon, so I reckon that would be really annoying to some people who use the chairs. It’s interesting that you mention the wheelchair logos. I hadn’t realized there was a big logo on the back, but I’m not surprised. (I’m searching for a picture right now, but can’t find one that shows the back of the wheelchair.) As I was writing that about the wheelchairs project and the Saints’ perception of disabilities, I was wondering how many local people in recipient communities realize that the LDS Church is behind that project. I guess the upside of a tacky logo on the back would be that it sends a message to members (and non-members for that matter) that the Church values people with disabilities and considers them worthy of a significant economic investment. It would be interesting to find out if that initiative in particular has influenced the way that members think about disabilities and people with disabilities. Excellent post, Blair. Thank you. Wow, I’d never heard of this. Fascinating. Nothing to add, but this is really great work Blair. I’ve really enjoyed your series and commented only occasionally. But this part has many issues that hit me directly. I hope this comment isn’t too long, too incoherent, or too late. Background: I am a born in the covenant member of the church and the parent of a disabled son who is since deceased. I haven’t read any of the texts in your footnotes except the Emma Smith biography. I read this biography shortly after learning about my son’s disability (not evident at birth). My empathies while reading this book inclined more toward what a young woman did for love rather than her experience as a mother of a disabled child. Point 1 – Extrapolating Joseph’s view of disability either in a cultural or gospel sense: I think all of this is pure speculation. The death of the child was so immediate that he’d have had no time to even process it. Emma’s perilous health was supremely important. The child died either quickly or was stillborn and there is no indication in any record that there were any conscious actions on anyone’s part to hasten the child’s death. Culturally, with 150 more years of scientific and cultural influence and many more years of formal education distancing my experience from theirs, I spent uncounted and agonizing hours examining why my son had his condition. I considered parental responsibility scientifically and scripturally, was this genetic damage or past sins. That kind of reflection is not instantaneous. Even anti-Mormon reports that might culturally link the deformity to parental responsibility (weak genes or sinful actions) would be so much water off a duck’s back beside all of Joseph’s more immediate problems. Therefore, I think any speculation is simply distraction. Point 2 – Did Joseph continue to carry the burden of that death and how did it influence future statements or revelations: not only is this speculative and unknowable but also a red herring. There were so many other deaths of children and loved ones prior to this and between this one and any statements, translations or revelations, to assume that this loss was formative is grasping at straws. Point 3 – Lack of evidence in the Mormon written record has some meaning: I don’t think this lack indicates either cover-up or any other deep meaning. The experience of losing a child to death was much more common then than now, and although it is a pain that doesn’t heal, people also recognized the need to pick up their lives and move forward. This was also not the only child that Emma and Joseph lost. Lucy’s not mentioning the deformity is also not a cover-up. If it was, she would not have mentioned him at all. Thank you giving the life of this child a little more acknowledgment in the historical record. It’s nice that he won’t be passed over again in this telling of the story. But dwelling on this loss or his deformity, even though it was their first child, is putting more weight on it than it deserves. Thanks for your very thoughtful comment, charlene. To your point one, you note that we are basically left with speculation as to how the death impacted Joseph and Emma. I agree. You also say that “any speculation is simply distraction.” That’s where we disagree it seems. I think speculation on this point can lead us down interesting paths, strange roads we hadn’t considered traveling down before. What I wanted to evoke with this post, though, was the sense that the historical record leaves so very much unacknowledged. That goes for Joseph, but it also goes for our own lives, I think. To your point two, “to assume that this loss was formative is grasping at straws.” This seems as much a speculation as anything I’ve suggested. You’re right that the general culture of death was different back then, different for them than for any of us today. “The past is a foreign country” and all that. Sam Brown’s book goes a long way in trying to take us back to the mindsets they might have operated through. Notice that I said the potentially formative experience. Again, the post is intended to provoke reflection on the limitations of the historical record, in this case regarding a deformed child most members haven’t ever heard of. As to point three, I don’t think anyone was engaging in a “cover-up,” and didn’t intend to give that impression. As to giving this more weight than it deserves, aside from being a tribute to the child, and in an indirect way to the many unnamed children who we’ve lost, what I hoped to communicate here is that we can’t know exactly how much weight it deserves given the records we have available. This should inculcate a bit of epistemic humility when we undertake to write our histories, the type that the best historians I know try to cultivate in their work. HI Blair — Turns out Infant Baptism remains super-important to non-Canonical Catholics. See The Society of St. Pius X’ Limbo is Not a Theological Hypothesis But a Truth Taught by the Apostolic Magisterium from March 2009. Come on. Everyone knows Limbo is just a fun party game. Thank you, Blair. Your reply was as thoughtful and careful as your OP. I am enjoying this series. Thank you, I’m enjoying it as well, all of the really excellent feedback from you and other people who’ve taken time to share their personal thoughts, it has been a tremendous help in my research.